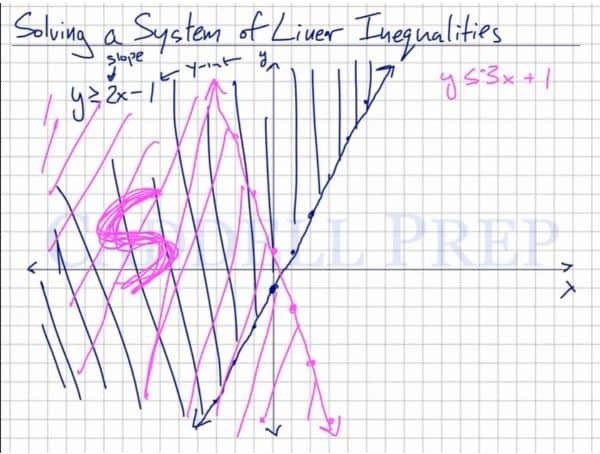 Here is another set of examples to show you how to solve a system of linear inequalities. In this example, we have the two equations, and . Both of these equations have a line under their symbols, which means that both equations include the lines. The lines are both solid. For the first equation, , the symbol (greater than or equal) means that the area above the line will be shaded. As for the second equation, , the symbol (less than or equal) means that the area below the line will be shaded. This creates an area where the areas of the two equations overlap. This area is the solution of the equations. Let’s go over solving a system of linear inequalities. In order to do that, we have to graph our linear inequality first. Here we know that slope is and -intercept is . Let’s graph it with a solid line since it is also equal to a line. Then let’s shade the area above this line to represent everything greater than the line. Again, it’s a solid line since it is also equal. And shade everything below the line to represent everything which is less than the line. Any point or coordinates in the shaded area is a solution of these two inequalities. The top inequality will have a dotted line then shade everything at the bottom of the line to represent all values with less than. The bottom inequality will have a solid line and shade the area above the lines. Our solution is where the two shaded areas overlap.